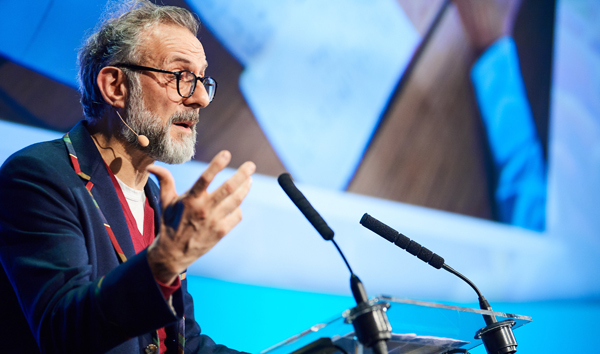 In his keynote address at FFA2018, Massimo Bottura, Chef Patron of Osteria Francescana and Founder of Food for Soul, explained how he is raising awareness about food waste and using food as a form of social inclusion. Speaking to the attentive audience, he described how every year, thirty-three percent of the food we produce goes to waste while almost one billion people are undernourished. In 2015, he and fellow chefs created a new food and architectural space inside an abandoned theatre in a neglected neighbourhood in Milan, turning leftover food from the Milan Expo into 10,000 healthy meals for the needy. After establishing the first centre in Rio de Janeiro, others have followed in Bologna, London and earlier this year in Paris. They all turn old food into nutritious meals and empower communities in the fight against food waste and social isolation. 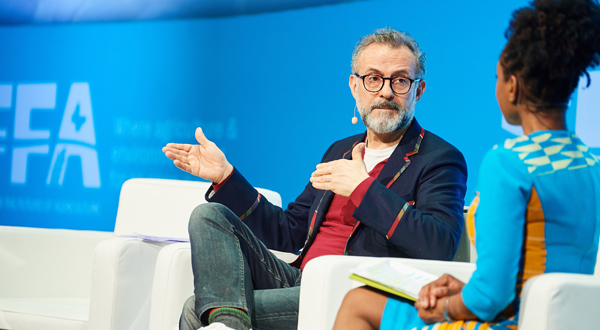 “Food is a powerful tool for change,” Mr Bottura said. Speaking to Femi Oke after his address, he said that: “My grandmother taught me that cooking is not business it is an act of love”. He then explained that wasting less is very important but one of the most important recipes he wanted to share is to buy seasonal and that people should restore relations with the farmers, fishermen, cheese makers and small shops. They can make suggestions and if you listen to them you will eat better, waste less and dedicate more time to yourself. He concluded that everyone can spend more time in the kitchen and: “Everyone can do something”.